The Hours of Operation must be set for each Target and Target Group as many Fonolo features utilize this field. 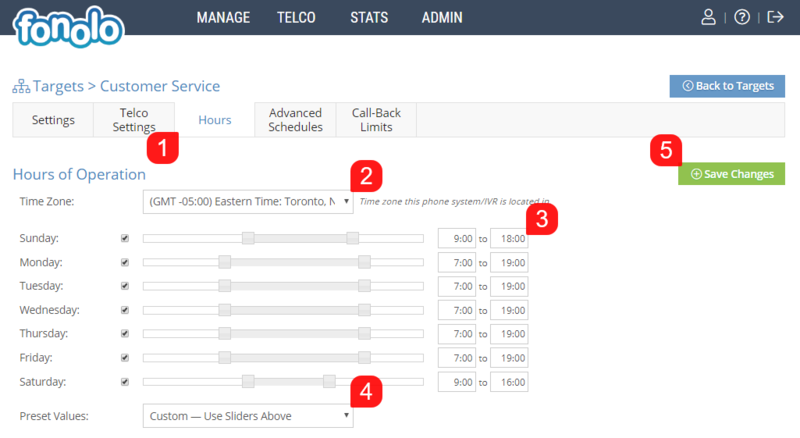 These hours are used to help Fonolo determine when the queues are open and for operating Call-Back Rescheduling, Call-Back Limiting, and the Mobile/Web widgets. By default, the hours are set to be open 24/7. Start by going to the Hours tab (1) at the top of the Target. First, set the Time Zone (2) that the queue is a part of. Next, select the specific days that you are offering call-backs on, and then drag the sliders beside each day to determine the business hours that these queues are open for (3). Alternatively, you can use the Preset Values (4) option below to select a commonly used, pre-configured day/hour selection. Once all of the settings are correct, click the green Save Changes button (5) in the top-right corner of the page.